Browse: Home / 2018 / August / 02 / INDIA TO SIGN QUID PRO QUO COMCASA FOR WAIVER FROM CAASTA TO BUY S-400 MISSILES & REDUCE RELIANCE ON RUSSIA WHEN 2 PLUS 2 MEET IN DELHI –USA’S GOAL TO WEAN INDIA AWAY FROM RUSSIA ENTERS THE LAST LAP. USA’s STRATEGY ? USA has become an oil exporting nation so IDF analyses the period ahead portends very, very trying days for China, Iran and Russia in economic terms due a trade war let loose by President Trump which will affect India. Chinese and Iranian companies are in big crisis. Trump’s aim. IDF posted the 2 plus 2 meet was postponed by Secretary of State Pompeo. It was deliberate as the agenda was not complete to USA’s expectations. The agenda is going through, “Last Minute Jugad”. Dr APJ Abdul Kalam always told Project Directors. “Push push….no waste time, less files more work.” A nuclear submarine was born, like his missiles. The 2 plus 2 meet will try cement a strategic tilt to USA in US-India Defence Communications, bound by CISMOA calling it COMCASA which links communications with equipment and systems and inter-links and if it’s lax can lead to Intelligence leaks as India does not have its own massive sever system like China or USA. Even Indians rely more on Gmail for GB space free ! 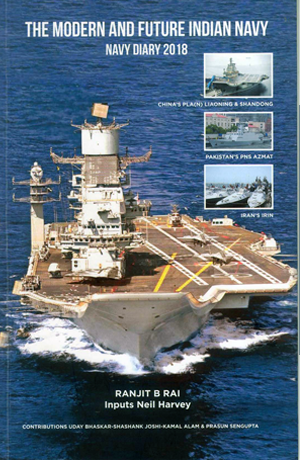 Indian Navy uses US supplied secure Modem Satellite Communications CENTRIX in Ex Malabars connected to the picture in USN ships and Pentagon. It works seamlessly. Indian Navy can now ask for it for MDA to augment it’s centre in Gurgaon. Pakistan Navy ships have it for TF-151 in the Gulf. This 21st Century is a maritime rich century and India, Pakistan and IOR nations which hold geographic aces, attract the larger world powers. Pakistan has trucked with cash rich enemy of India which is China; and India has trucked with USA whose enemy is China. 2 plus 2 is work in progress ? China is supplying neighbor Bangla Desh two more latest 053 HH Missile Frigates after supplying two second hand Qing submarines at friendship prices. PM Bangla Desh has promised its Armed Forces a ‘Goal 2030’, to be a ‘Three Dimensional Power’. 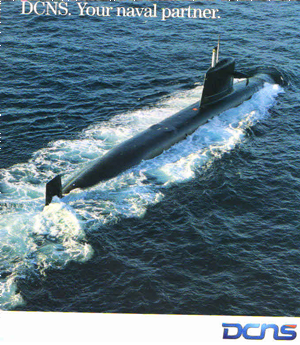 Pakistan will get 8 submarines and 2 M22 Frigates. Nothing comes free in Geo-Politics. Arms reliance helps the Chinese to move in to the IOR with a Necklace of Ports, that President Trump wants to derail with a Trade War, and even stop an IMF loan to Pakistan to fix China’s CPEC. India-USA relations were frosty when USA supported Pakistan but a new era was sown by 2005 led by Navy’s Exercise Malabars. A one page Defence Framework was finalized in a midnight meeting between India’s NSA MK Narayanan and Condelezza Rice in DC. This was an essential step to ensure the 123 Nuclear Deal went through later by PM Dr Manmohan Singh who had instructed his Defence Minister Pranab Mukherjee to go to USA with NSA and sign what best USA offered. During the signing it is reported, Secretary Rumsfeld asked Minister Mukherjee if he could do anything for him. Mukherjee asked Rumsfeld to shift India from Pacific Command to Central Command which holds Pakistan. Rumsfeld was quick as always. to say, “Give me an Indian Division in Iraq(where US Military was involved) and I will transfer India”. The Vice Chiefs shook heads, but now it’s Indo Pacific Command to pull in India into the South China Sea (SCS) where Navies have exercised and Japan has sent a Helicopter Carrier. USA has asked for Indian Military officers in Central Command at Tampa and in Indo-Pacific Command in Hawaii. Both nations militaries have now become comrades ! Every Indian family has a kin in USA and Indians are deep into US politics. Bureaucrats love FMS–G to G trade so India has easily procured $ 15 billion worth of planes and helicopters for the Air Force and Navy and is set to order another $5 billion worth of 28 Guardian Drones, Helicopters and 4 more Boeing 737 P8i Maritime Reconnaissance planes and helicopters for the Navy to add to the earlier 8, and missiles and 9 Apache Attack helicopters for the Army. 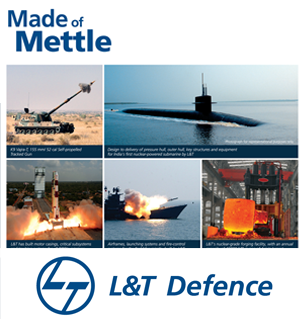 More equipment was discussed and offered in the recently concluded 7th DTTI meet, reported on this site. IDF reports, that brick by brick, PM Modi helped by BJP General Secretary Ram Madhav have cemented, the India-US Security relationship after agreeing to a Joint Strategy for Asia Pacific in 2015 with President Obama with China in mind, that Ambassador Frank Wisner had begun in the 1990s. Wisner also advised PM Narashima Rao not to test the nuclear bomb, which PM Vajpayee stealthily did in 1988 and changed India’s face. Very few knew, and unsung heroes were DRDO’s APJ and Santanam. BARC gave the cores. Foreign Secretary then Amb Lalit Mansingh said he did not know, before the test ! In SCS US Navy sails past South China Sea’s (SCS) manmade islands’ 12nm territorial waters, to show it does not recognize the rocks belong to China, but can do no more. India was asked to join SCS patrols but declined. 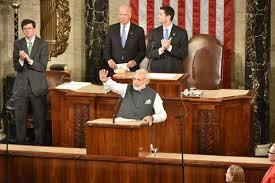 USA is hopeful India will join to show joint annoyance to China as PM Modi had assured US Congress in his oratorical of his intent, to become USA’s bulwark in the East to Congressmen’s delight, who have moved to admit India as a special Tier 1 Strategic Defence Partner. USA will demand allegiance. “Follow CAASTA”, Nikki Haley said ! India had no option but tilt to USA to meet the growing China Pakistan challenge. The goal that USA set in 1990 was to wean Indian Kohinoor away from Russian Defence supplies when Soviet Union collapsed, first through supplies from Israel who supplied US patented high technology UAVs, EW Systems, Phalcons and later Barak Missiles and top of the line radars. This succeeded. As of writing USA, NATO, EU and QUAD which includes India, Japan and Australia are not a military pact, but are militarily ranged against China, which is a nuclear power. (Slides Credit Khurana). 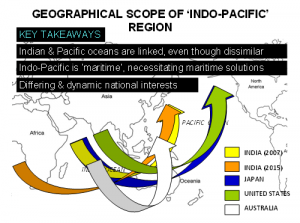 Western nations or India can do little in SCS as China has usurped and fortified the rocks into islands within its Nine Dash Line in a step by step Strategy. Western leaders know, a military action which can turn nuclear, will be disastrous. Even North Korea threatened USA. The current US–China spat is different from the USA-Soviet Union Cold War, as USA is intertwined with China in trade and can hurt each other, probably China more. In long term World Economy will be hurt and India is being sucked into the game as USA has sanctioned Russia and Iran, both India’s friends. 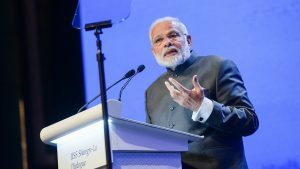 At Singapore’s Shangri-La dialogue PM Modi articulated India’s policy and showed bravado and warned China on Freedom of Navigation and law without naming it, and affirmed India’s interest in the Indo-Pacific from Africa to USA. PM Modi is possibly assured the Indian Navy can contribute, but IN will needs more sea legs discussed in next IDF post ! 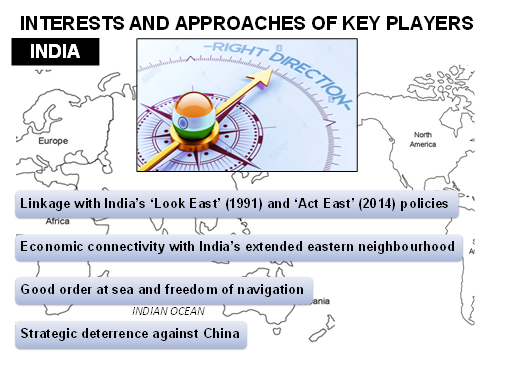 India has to tread carefully on SCS. No White Shipping has been stopped for innocent passage, and China will one day show it’s card with Taiwan’s Itu Aba island and claim EEZ. (See Picture) This could reopen a Pandora’s box on the UNCLOS ITLOS award with a huge EEZ for Taiwan, which was missing in the 2016 UNCLOS ITLOS arbitration award in favour of Philippines. The court dismissed China’s historic claims. It refused to accept Taiwan’s map of the 9 Dash Line and its EEZ claim and importance of Taiping (Itu Aba) island, despite Taiwan applying to be a party. Taiping (Itu Aba) has habitability and an airfield with Coast Guard and troops so gets 250nm EEZ if accepted. Taiping has not been named a rock in final list in the award’s summary like others in Philippines’s Spratlys. , 12 pages do discuss the status of Ibu Aba, its pros and cons by experts quoted. India needs to consolidate and meet with larger security challenges in South Asia, Pakistan, Afghanistan, Doklam for Bhutan and beef up India’s Navy as a Net Security Provider in the Indian Ocean Region on priority, and promulgate rules and SOPs for IOR nations. USA cannot help and may agree to good Taliban back in Afghanistan. Sadly the Defence budget especially Navy’s 2018-19 has dwindled to record lows and costs of ships risen and many orders cancelled, despite a 7.5% growing economy. Shan Na Varuna.